Maybe you remember Kali Blue and her story. Yesterday, she was reunited with Phillip. We all know what these wonderful creatures mean to us–in some cases, they literally save our lives. Quite possibly there are no words to cover how they touch our soul. The time lost–cannot be gotten back. Nonetheless, each day they have is a precious gift. Let’s all remember Phillip and Kali Blue and pray that she can make a quick adjustment. 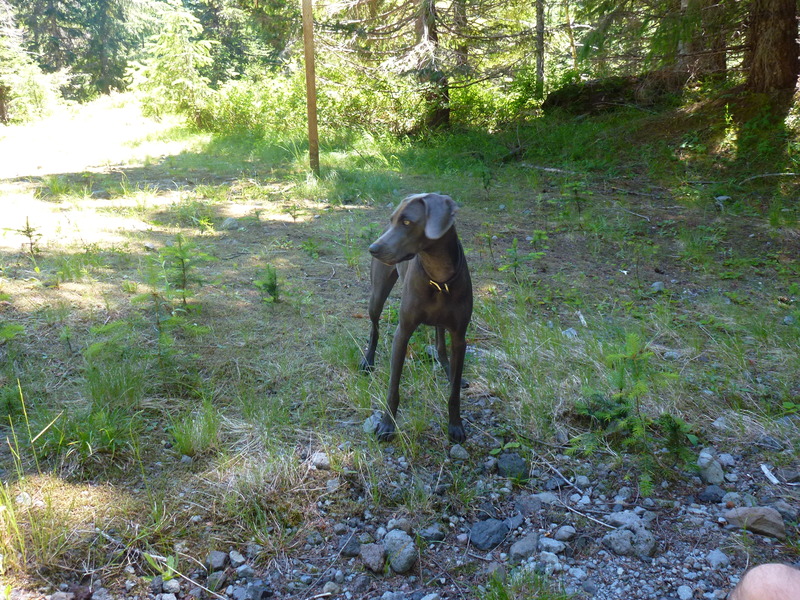 After all, we are talking about the Weimaraner–change is very hard. We wish her all the best from here on out. Today–we join in the celebration of her return. Uh–thank God for microchips, too! Folks –be sure to register those microchips. Every OwyheeStar puppy leaves with the AKC Reunite Microchip. We just wanted to send you a quick note to thank you and Cliff for this amazing little guy. He’s the perfect addition to our family, and makes us laugh daily with his goofy personality. I think we struck gold again because Quinn is just as mellow as Jake was as a pup. He house trained quickly, is very smart, and goes right along with the rest of the pack as you thought he would. Our girls absolutely adore him. We’re so grateful for the work that you and Cliff have done to give our boys the best foundation! Hope you are well. We appreciate loyal clients like you–and we are beyond happy that your second OwyheeStar worked into the family so well. We truly appreciate the update. Thanks, ever so much. This is Lindsay, and we purchased our wonderful dog Jake (Pepper x Blue litter) from you in Fall of 2008. He’s almost 10 now, and we just love him to pieces. We’re considering adding another pup to the family and of course, wanted to come back to you. Our daughters are 6 and 8 this year and they absolutely adore Jake. He’s the best dog we’ve ever had! I’ve attached a couple of Jake’s agility pictures from last summer too. He seemed to really enjoy it. Thank you, Lindsay. We look forward to working with you again. We hope the experience is equally rewarding. We are thrilled Jake has been such a great family member. We especially love the agility photos, but all four photos are excellent. 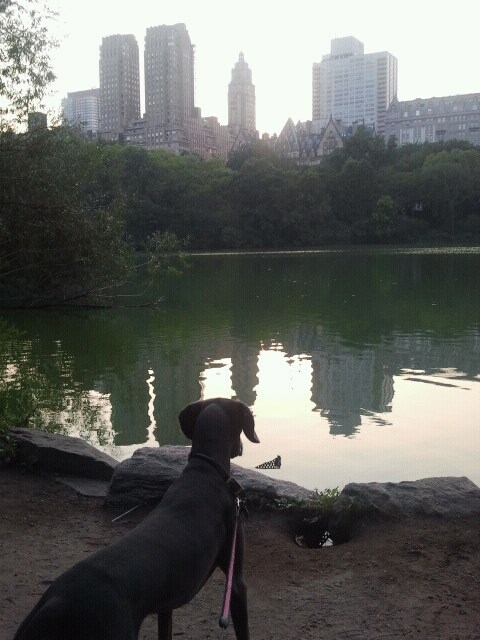 We are happy to report that life is going well for Ashley, Lola and me (Cody) here in the Big Apple. We live on a quiet brown stone street less than a block from Central Park. As far as Lola knows, she lives on a quiet street with a 800 acre back yard. Surprisingly, and to our satisfaction, New York is a very dog-friendly city. 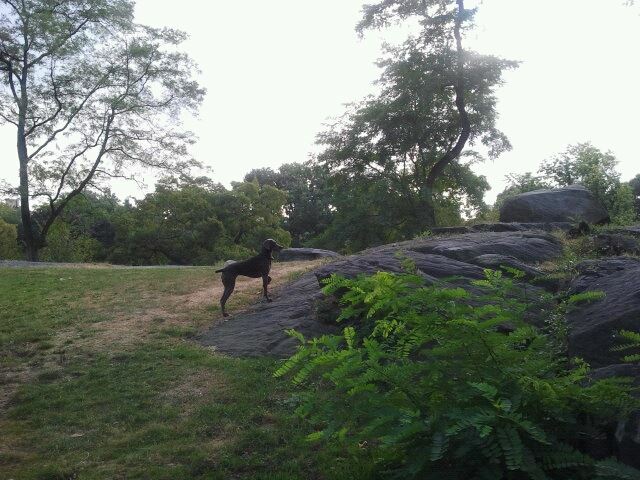 Every morning from dawn to 9:00 am the entire park is an off leash zone, and all the local dogs come out to play. 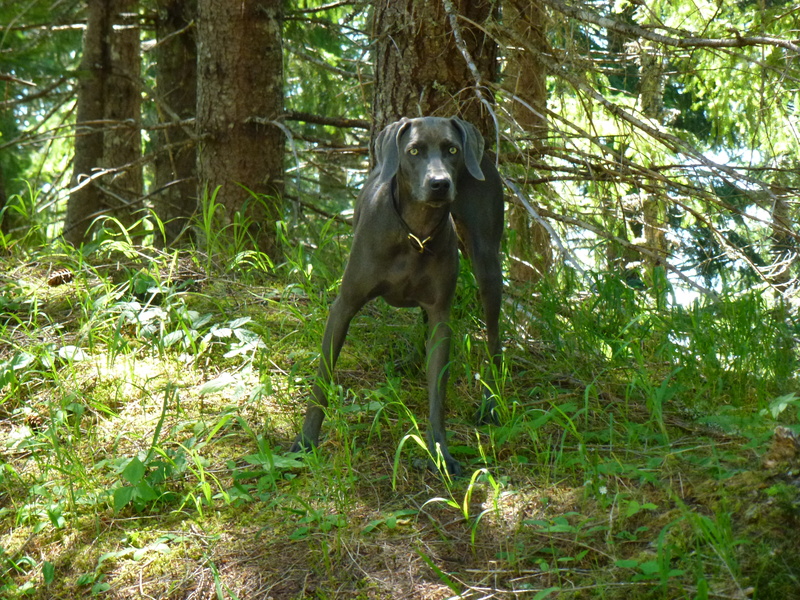 Seeing how Lola gets along with other dogs so well, she has made many friends, one of which is another blue Weimaraner – I swear they could be sisters. I don’t know what you have available in the coming months, but we are very much interested in getting another blue female. Let us know what our prospects are for getting a new pup before the end of the year, if possible. We love reading your blog, and seeing what the different lives that these dogs have. I think that is one of the best parts about your blog! Yes, we can travel– I would be able to fly into Boise to pick her up. 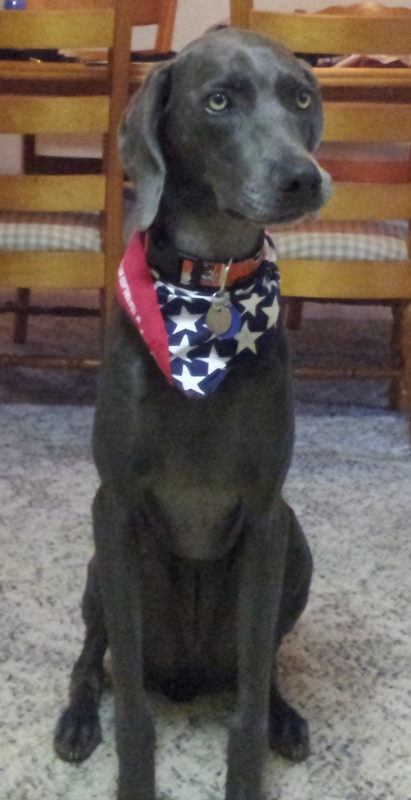 Breeder’s Note: We are delighted you want to add another OwyheeStar Weimaraner to your family. We look forward to the opportunity to make this happen again. As we fast approach our move to the East Coast, we are trying to decide the best way to transport ourselves. We are basing our comparisons on price, travel time, but mostly, the stress it will put on Lola girl. We are wondering your opinion on flying dogs. If we do choose to fly, we will be taking a direct flight from Seattle to Newark, NJ with Alaska Airlines which is approximately a 5 1/2-6 hour flight. We would get a thunder shirt for her, and we have heard there is a sedative that you can get from the vet to help ease the stress of travel. Is it safe and OK to travel with Lola on the airplane? People fly with their large breed dogs all the time. Some people travel to dog shows with multiple dogs (all riding in the belly of the plane in separate kennels). People relocate overseas, and bring their dog with them in the same manner. 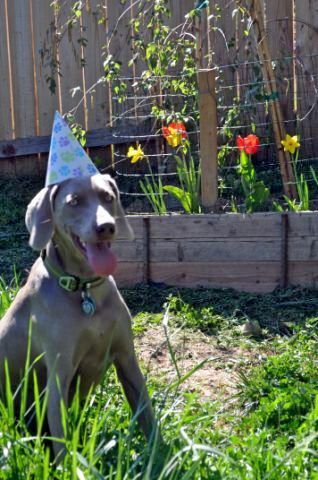 This is another instance when having a crate-trained (and crate-friendly) Weimaraner is a plus. Check with the airline of your choice to make sure they can accommodate you, and be sure to get all the regulations and requirements. Usually, there is a fee, and you are required to have a current health certificate. Preparing the Weimaraner for any scenario is wise. They need to be used to traveling in the crate. Take them in the car or pickup truck. Try to have some jostling, etc. The Thundershirt is a good idea. Check with the airline as to whether they will allow you to sedate the Weimaraner. The six-hour flight seems very reasonable; it is less time than an eight-hour night. We feel as long as she is crate trained, and you work on adding a bit more stress in the crate, that flying would be the ideal situation. There are fewer risks in the direct flight, as compared to making a trip across the country. Not every airline offers pet service. Some offer carry-on pets only. Alaska-Horizon, Delta, and United are three airlines we have used. You might consider sleeping on some old pillowcases, and then filling them with shredded paper. Seal them in an airtight bag until you fill them just prior to the trip. That way, they retain your scent. Feed and water her awhile before she is going to fly, and keep her meal light. You don’t want her to suffer travel sickness. For small pets, or for Weimaraner puppies (8-10 weeks of age) that qualify as carry-on luggage, check out the guaranteed on board program (click here). You can also find other information regarding traveling with your pet here, such as links to pet-friendly airline websites. 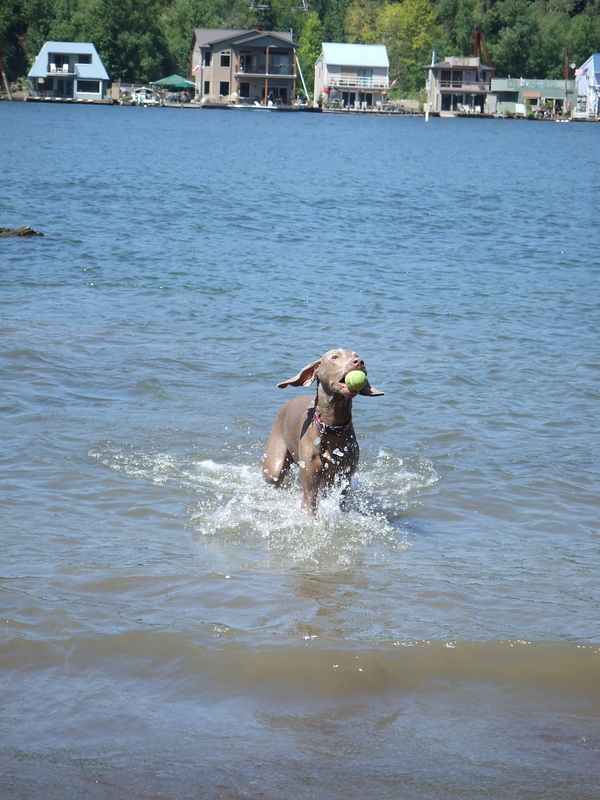 One reason to crate train the Weimaraner is that you cannot predict what might happen. The crate can save your Weimaraner a lot of unnecessary stress. Initially, a lot of folks struggle to get their Weim crate-trained, but this helps with housebreaking, and prepares them for situations you cannot otherwise manage. When considering flying with your Weimaraner, there are many considerations. The crate-trained Weimaraner is going to be able to cope with the trip, whereas the Weim that has not embraced the crate will not think of it a safe place. Weighing a long road trip against a flight is a personal decision. In considering whether the Weimaraner can deal with the flight, and adjust well, only you can know. Phillip writes that he has posted this ad on Craig’s List. She is licensed (M71323) and microchiped (AVID*066*622*532) She has an OSU collar on with both her license and microchip tag. She was last seen Sunday afternoon around MacLeay and Connecticut near WINCO and the middle school. Please contact me if you have any info, 503-510-3059. I am willing to give a reward for anyone who can bring me my dog. Please she is missed dearly!!! “Woof, Woof” I just went out the yard to look for my Daddy. He left, and the guys were busy. I thought maybe he got lost, so I went to find him. OwyheeStar thanks you for your help……we pray for Kali’s safe (and swift) return! NOTE: OwyheeStar holds your personal information in the strictest of confidence. Phillip’s name, and contact information has been posted at his request. I hope all is well. Life has been a whirlwind for Ashley, Lola, and myself. We got married this summer, went on a wonderful honeymoon to Kauai, and I passed the Washington State Bar exam. Ashley and Lola have been holding down the fort. I’m so thankful for Lola, especially in times like this where I am away from Ashley. It brings me a great deal of comfort to know that they have each other. I miss both of them very much. Lola has been doing great. We have a dog walker four times a week while Ashley is at work and once a week she goes to doggy daycare (a whole day affair). The dog walker is a wonderful woman and she loves Lola. Ashley began running with Lola and sometimes they go up to 10 miles. Ashley spent Thanksgiving with me in NYC and my mom looked after Lola (Lola loves my mother) for the week and she had a great time with the family at the beach. Ashley said that Lola was a little depressed after leaving my mother. Lola is a happy, healthy and well mannered companion. Anyway, I just wanted to drop you a line and let you know that Lola is doing great. We hope you enjoy the photos of Lola taken over the summer.There are some from a play date that we had with Coco and Opal (Elle x Blue) over the summer. Farley (our OwyheeStar) is just over 2 years old. He has brought so much joy and love into our family. He is incredibly sweet and loving, yet is also very energetic and loves to play. Breeder’s Note: We love to receive an update like this. 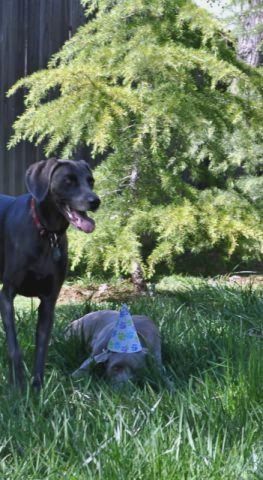 By the time the Weimaraner is two years old, most of the puppy-hood behavior is behind them. An occasional bout could spring-up during the next twelve months, but most of those challenges are in the rear view mirror. For those that wonder if they will make it through, ‘chill-out’–you can do it! From Phillip: I just want to give a quick update on Kali-Blue, (our OwyheeStar). She is doing great!! Training is going good too. I have attached some pictures from training back in August she is all ready for her first hunt season. I hope you enjoy these great photos of her in action! PS: I will send you a more detailed update after her first hunt this year and try and get you a good story for the blog when I go on my big hunt this year. Hi Shela and Cliff! Scout here. I thought I would tell you how I am progressing, since I just turned one. My mom and dad gave me a pig ear birthday cake and it was soooo yummy!! I got to see some of my best friends too: Abby the mini Dashund and Button the Golden Retriever. We had soo much fun! Afterward, Mom and Dad took me to the lake for a bit. It was so cool! There was so many things to smell! When we got back to the house, I got two new toys! I got a new NylaBone and a new Kong. Wow! I like birthdays! Tell me again why I am the one wearing the hat…. At one year old, Mom says my personality is unique and quite the opposite of my sister, Remington’s. She says that I am a cuddler and that I have two speeds: on and off. She affectionately calls me Sweet Pea and Dad called me Scouticus (kind of like Spartacus). I like my nicknames. Speaking of being the opposite of my sister, Remington is my best friend in the whole wide world! We play together all day long, we cuddle together, we even have learned how to tag-team Mom and Dad together. Oh what fun we have! Well, I’m going to go. I want to get back to chewing on my NylaBone. I hope you are doing well!